Forward operating base (FOB) Rhino, also known as Camp Rhino, was the first US land base established in Afghanistan during Operation Enduring Freedom. It was located in the Registan Desert, 100 nautical miles (190 km) southwest of Kandahar. The site was observed by United States Navy SEALs for four days prior to Operation Rhino led by the United States Army's 75th Ranger Regiment (3rd Ranger Battalion). The raid included both Airborne and Air Assault insertions. Objective Rhino was then handed off to U.S. Marines from the 15th Marine Expeditionary Unit (15th MEU) and Charlie Company BLT 1/1 (Battalion Landing Team) and used to build up a coalition footprint to conduct leading combat operations in Helmand and Kandahar provinces. The facility was surrounded by a 10-foot (3 m) wall and four hardened guard towers. Within the facility there were numerous new warehouses, offices, and even a small mosque which was declared off limits to all personnel as a sign of respect. The paint on some of the buildings was barely dry. Sealed roads ran throughout the camp, and it was also bisected by a 3-foot-deep (0.91 m) cement moat. Camp Rhino was in use from 26 November 2001 to 1 January 2002. At its peak, the camp contained about 1100 U.S. Marines, under command of Brigadier General James Mattis, as well as U.S. soldiers and U.S. Navy Seabees, Australia Special Air Service Regiment (SASR), and dozens of embedded reporters. Camp Rhino was the US-led coalition's first strategic foothold in Afghanistan and made the ground war in Afghanistan possible. While Rhino was being established, fierce battles between Taliban and Northern Alliance troops were still underway near Kandahar. But then the Taliban, realizing that US forces were now very close and were willing to operate at night, capitulated and retreated north to the mountains of Tora Bora. A Light Armored Reconnaissance Element of the 15th Marine Expeditionary Unit and coalition forces, supported by 26th MEU, deployed forward to capture the Taliban stronghold of Kandahar International Airport in mid-December 2001, following a three-week period of consolidation at Rhino. 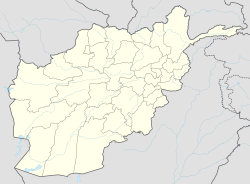 Kandahar International Airport then became the main coalition base in southern Afghanistan, while Bagram Air Base was established further to the north near Kabul. The majority of forces who had initially based at Rhino had re-located to Kandahar by Christmas Day, mostly transported by fixed-wing transport aircraft. ^ "Operation Enduring Freedom: Raid on Kandahar, October 2001 – March 2002". U.S. Army Center of Military History. Retrieved 25 February 2014. This page was last edited on 14 June 2018, at 11:35 (UTC).